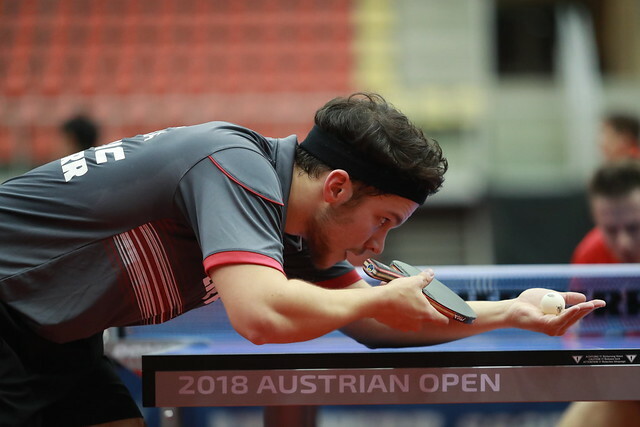 Winners earlier in the year in Australia and Japan, the Korea Republic’s Jeoung Youngsik and Lee Sangsu, the top seeds, duly booked their place in the Men’s Doubles final at the Seamaster 2018 ITTF World Tour Platinum Liebherr Austrian Open in Linz, by emerging successful on Friday 9th November. In the title deciding contest they will meet Japan’s Masataka Morizono and Yuya Oshima, the no.2 seeds. At the semi-final stage Jeoung Youngsik and Lee Sangsu accounted for Hong Kong’s Ho Kwan Kit and Wong Chun Ting, the no.3 seeds (11-7, 11-9, 11-4); Masataka Morizono and Yuya Oshima, the no.2 seeds, ended the hopes of the combination formed by Romania’s Ovidiu Ionescu and Alvaro Robles, a pair who had been required to negotiate the qualification tournament (3-11, 13-11, 11-5, 11-7). Furthermore, Masataka Morizono and Yuya Oshima have a debt to settle; prior to this year they had reached six finals on the ITTF World Tour, on all six occasions they had won. Now this year before the meeting in Linz, they have appeared in three finals, in Australia, Bulgaria and Hong Kong; they have lost all three, notably in Australia suffering at the hands of Jeoung Youngsik and Lee Sangsu. However, whatever happens in the final, Jeoung Youngsik and Lee Sangsu will end the year in top spot on the Men’s Doubles Standings, the position they currently own (769 points). The situation for Masataka Morizono and Yuya Oshima is in abeyance. They started the tournament in Linz in the no.6 spot (407 points); should they win on Sunday, they will move into second place, lose and it will be fourth position behind China’s Ma Long and Xu Xin (588 points), Ho Kwan Kit and Wong Chun Ting (575 points). Meanwhile, for Ovidiu Ionescu and Alvaro Robles there is no place in the Grand Finals but surely that must be their goal next year. They came together by chance at the Seamaster 2018 ITTF World Tour Kaisa China Open in late May, sensationally at the semi-final stage they beat Ma Long and Xu Xin, before losing to the host nation’s Fan Zhendong and Lin Gaoyuan. Now on only their second appearance they reached the penultimate round, quite outstanding. The final of the Men’s Doubles event will be held on Sunday 11th November, the concluding day of play in Linz.